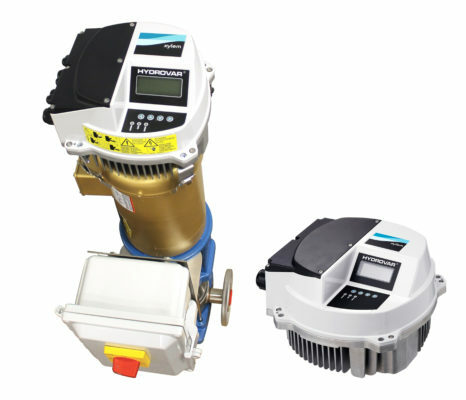 Hydrovar is the intelligent pump controller that matches the performance to system demand. The Hydrovar is easily mounted directly on the motor of the pump and will fit on any standard TEFC NEMA motor. This makes the Hydrovar an excellent choice for retrofitting and upgrading of fixed speed systems. There’s no need for an external control panel when using Hydrovar. Quickly install directly on any TEFC motor without running new power to a wall-mounted control system. The quick start up guide and intuitive menu system makes the Hydrovar easy to set up and operate. Advanced programming features can optimize the Hydrovar for almost any application. A motor running at 80% of its maximum speed uses 48% less energy. With energy savings of up to 70% on partial loads alone, the typical investment payback period is less than two years depending on energy costs and pump operating times. Maximum ambient temperature 104º F.
Indoor enclosure: NEMA 1. Avoid excessive dust, corrosives, salts and direct sunlight.